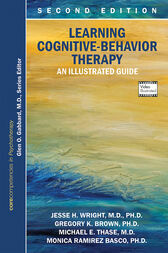 Building on its successful "read-see-do" approach, this second edition of Learning Cognitive-Behavioral Therapy: An Illustrated Guide seamlessly combines 23 all-new videos with informative text and figures, charts, worksheets, checklists, and tables to help readers not only learn the essential skills of CBT but achieve competence in this important evidence-based treatment method. Opening with an overview of core cognitive-behavior therapy (CBT) theories and techniques, leading CBT practitioners then describe and demonstrate how to build effective therapeutic relationships with CBT, conceptualize a case with the CBT model, structure sessions, and resolve common problems encountered in CBT. The all-new videos feature clinicians demonstrating methods in real-world settings and include new topics such as safety planning and uncovering and changing maladaptive schemas. Proven as one of the best teaching tools for building competence in CBT, this new edition will enrich readers' understanding and practice of CBT. Jesse H. Wright, M.D., Ph.D., is Professor and Kolb Endowed Chair of Outpatient Psychiatry, Director University of Louisville Depression Center, University of Louisville School of Medicine in Louisville, Kentucky�. Gregory K. Brown, Ph.D., is Research Associate Professor of Clinical Psychology in Psychiatry at the University of Pennsylvania School of Medicine in Philadelphia, Pennsylvania. Michael E. Thase, M.D., is Professor and Chief of Adult Academic Psychiatry at the University of Pittsburgh Medical Center in Pittsburgh, Pennsylvania.